Hello again! It seems that before anyone makes purchases nowadays, they will do their fair share of going online and searching for other people's reviews before deciding whether to spend their money to make sure they won't just buy it and then have buyer's remorse because it doesn't do what it should. 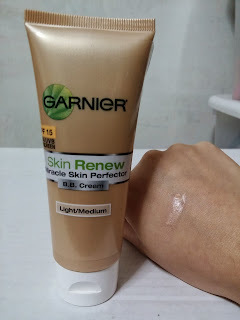 Therefore, I am here to lend a hand and shall begin with today's review, something I've had in my personal collection for a while, the Garnier Skin Renew Miracle Skin Perfector B.B. Cream! This moisturizer has SPF 15 and I have it in the light/medium shade. Each tube is 2.5 oz or 75 ml, and that's a pretty big amount compared to other moisturizers, which are usually only 1 oz. I have used a fair amount of this tube already, but I have to say that it is not recommended for the summertime if you have oily skin. When it's humid, it makes it feel like you have an extra layer of skin on, and that's not a good feeling. I've read since that there is a version for oily skin so you may want to look into that if this doesn't sound good to you. It is kinda strange but only around my nose area, it doesn't blend well into my skin as with the rest of my face and you can clearly tell I have something on because it looks cakey. I have to mix it with another moisturizer for it to look more natural. There is a light coverage, which I wish could be more heavier because I usually don't want to do a whole face routine in the morning, I just want to do moisturizer and go. Therefore, the light coverage does not cover my dark circles when I wish it would. There is a pleasant scent to the product which I can't really describe, but I like it, not overwhelming or having a sunscreen smell. Overall, I would only use it sparingly in the cold winter months, and would not purchase this in the future because I don't like the heavy face feeling. I might try the one for non-oily skin if I see it for a good price.